Do you wish you had a large soaking tub to relax in after a long day of work? Perhaps you want to modernize your bathroom with a sleek shower and matching features. To make your dream bathroom makeover a reality, turn to the reliable experts at Star Home Remodeling. Since our founding in 2007, we have been helping homeowners update their homes to improve aesthetics and functionality, and we’ll be delighted to do the same for you! As a full-service home remodeling company, we can take care of all aspects of your bathroom renovation, including creating a stunning design for your new space that will be perfectly suited to meet your needs. 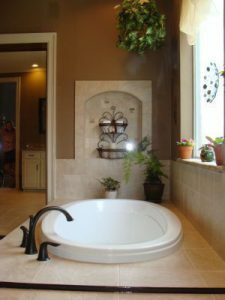 We can do everything from enlarging the square footage of the space to updating the room with aging-in-place products, such as a walk-in tub. Additionally, we can provide you with the premium products you’d like incorporated into your bathroom remodel. When you partner with Star Home Remodeling for your bathroom renovation, you can look forward to working with skilled technicians who are committed to customer satisfaction and professional installations. In fact, our work has earned us a number of acknowledgements throughout our time in business, such as multiple Best of Houzz awards. To get one step closer to enjoying the bathroom you’ve always wanted, contact Star Home Remodeling today. When you do, we’ll be happy to answer any questions you have about the bathroom makeover we can complete and schedule a design consultation for you at our showroom or your home in the Frisco, TX, area.